Posted By:Unknown | At:2:32 PM Be the first to comment! If you thought Herman Cain's comment about black people being 'brainwashed' was bad you need to check out Pat Buchanan's explanation of the comment. For the life of me I don't understand why people like Buchanan are giving a platform. I understand he makes for good television, but at what point do we say enough. He, Rush Limbaugh, and other people of their ilk would never be given a platform to spew anti-semitic nonsense, but yet they can say whatever they want about black people. It's amazing. On Wednesday, Cain told CNN that black voters "have been brainwashed into not being open-minded, not even considering a conservative point of view." 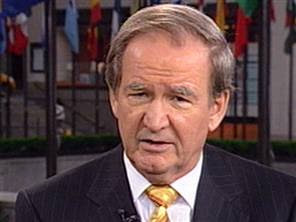 The comment received a lot of attention, and MSNBC's Martin Bashir asked Buchanan about it on his Thursday show. Buchanan said he wholeheartedly approved. "I think the African American community has embraced Great Society liberalism which has been devastating for the African American family," he said. "...I admire Herman Cain for standing up and going against, if you will, the conventional wisdom, and being a tough African American businessman." "Brainwashed?" Bashir said. "That's a fairly strong term." "I think what he's saying is they bought a lot of liberal propaganda on the liberal plantation and I think he's right!" Buchanan replied staunchly. "On the liberal plantation. Wow." Bashir said. "That's right," Buchanan said.